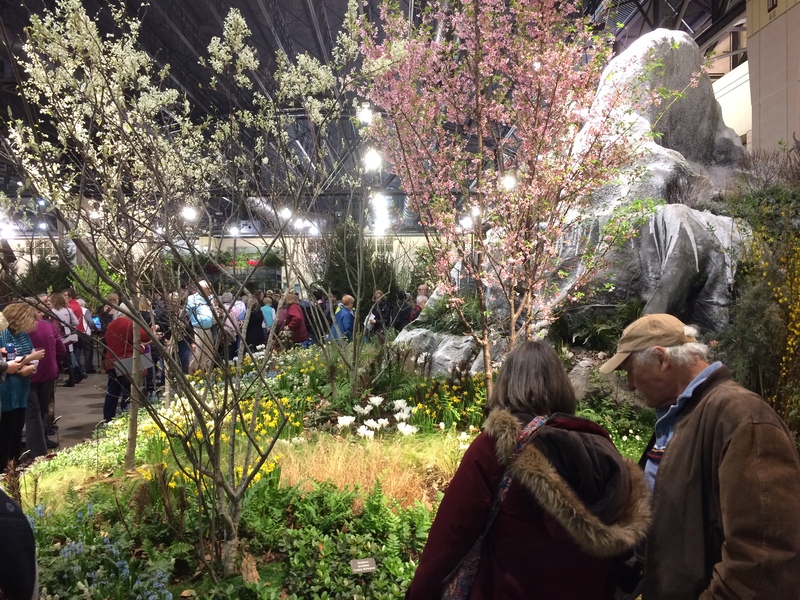 I’ve a close friend who oohs and aahs and maybe even finds her reason for being when she goes to the Philadelphia Flower Show, a massive and annual event that attracts numerous gardeners and other assorted nature lovers. Yeah, the Flower Show means a lot to her. She attends every year with her sisters, excitedly looking at exhibits both grand and small and sniffing out ideas that might be applicable to her garden. Basically, she loves to get her horticultural groove on. She was there with her female siblings two Mondays ago, devoting five hours of her life to the enterprise. And, I’m sure, had a remarkable time. As for me, on the other hand, I never entertained the idea of going to the PFS until two years ago. It’s not that I don’t like to look at flowers and other plants — I do! — but I guess the notion of seeing them indoors in artificial settings never rang my bell sufficiently. What’s more, I’m not in the market for floral or other gardening hints that undoubtedly would aid the small patch of land upon which my suburban abode sits. Hell, the subject just doesn’t interest me. And, I’m not embarrassed to admit, my thumbs are so far from being green, flowers and shrubs sprint down the block faster than Usain Bolt when they see me coming. But in 2016, after having dwelled in or near Philadelphia, my adopted city, for about 40 years, I had a change of heart. Why not go, indeed? 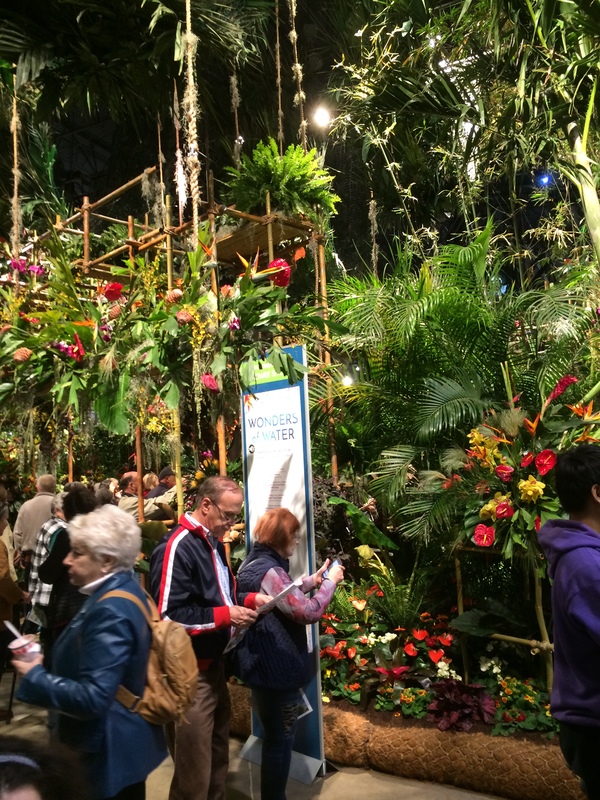 The Philadelphia Flower Show is enormously popular (200,000 or more bodies take it in each year) and known around the world. The time had come to check it out. Which my wife Sandy and I did. We had a pretty good time. One thing I learned at the show in 2016 is that flowers hardly are the only focus. Maybe it once was strictly a floral endeavor, but those days are in the far away past. Now pretty much all of nature is fair game. 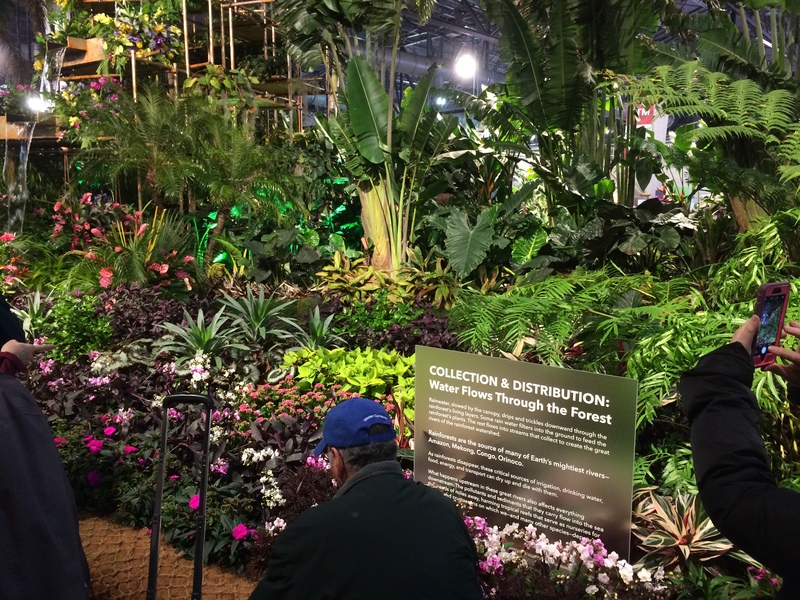 In the interests of accuracy it wouldn’t be a bad idea, I’d therefore say, if the Philadelphia Horticultural Society, which has been putting on the extravaganza since 1829, changed the event’s name. How about Flowers N More R Us? No? Well, I’ll give it some more thought. 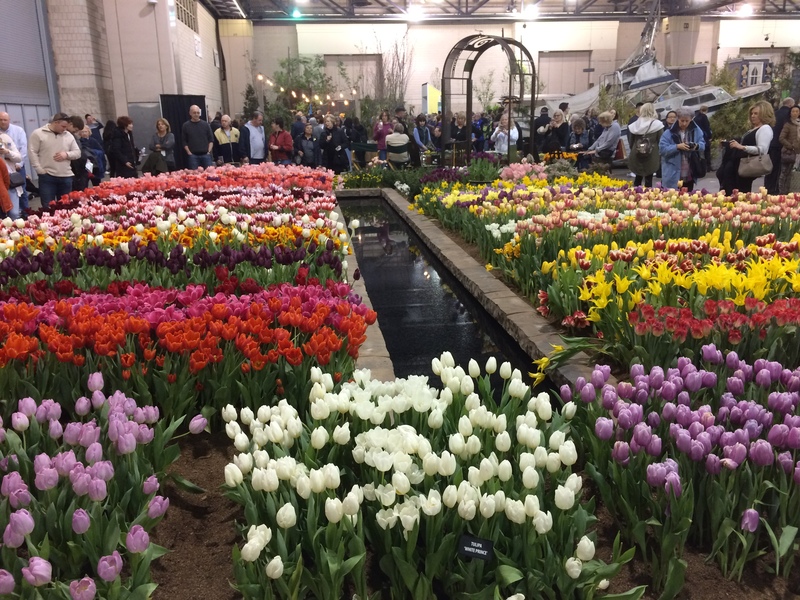 Anyway, for many years now the Flower Show has had a theme, a different one each go-round, to which about a third of the floor space is devoted. The displays within the themed section are the event’s biggest draw. The rest of the square footage is taken up by that to which the theme does not apply: small-to-medium scale floral and other plant displays, flora competitions, horticultural product vendors, and by refreshment stands. Two years ago the exhibits in the themed section had nothing to do with cultivated flowers at all, or with any other examples of horticulture for that matter. That’s because the topic at hand was the USA’s national parks, which, duh, are wilderness or near-wilderness regions. This year, though, cultivated flora was a part of the story in the themed district, which was dubbed “Wonders Of Water.” Still, the untamed substantially ruled, as a recreation of a tropical rainforest — rainforests, duh, being environments in which human hands play little part (except when man is leveling them, which is what our blighted species loves to do) — held 2018’s center stage position. I’m not complaining, by the way. It’s all to the good that the Philadelphia Horticultural Society has expansive viewpoints that encompass much of nature, not just the human-tailored parts of the picture. Admirably, I’ve now attended the Flower Show twice. Because on March 6 of the present year, the fourth day of the show’s nine-day run, Sandy and I entered the Pennsylvania Convention Center, which is in downtown Philly and only inches away from the city’s Chinatown neighborhood. The Flower Show took up a whole lot of the enormous structure’s acreage. I’ll say this about the quarters in which the PFS was staged: If you’ve seen one airplane hangar, you’ve seen ’em all! If I owned a hat I’d tip it to the Horticultural Society for having given it all they’ve got to transform an antiseptic mega-space into something more than decently attractive. Getting back to that rainforest, it was a beautiful, sprawling installation. Colorful, fragrant and dense, complete with misty rains dropping from on-high in one (or was it two?) spots, and a not-bad facsimile of a waterfall, it dominated the Wonders Of Water area in nothing but good ways. Truckloads of show-attendees clogged the pathways that wound within and around the rainforest. The Flower Show clearly is not the place to go for anyone seeking to get away from it all. Not that the crowds were unpleasant. They weren’t. Everyone seemed relaxed and respectful of their fellow tribe members, whose numbers included high quantities of young children and individuals who needed canes, walkers or wheelchairs to get around. Of the sizeable number of displays other than the rainforest in the Wonders Of Water zone, three grabbed me more than the rest. How cool was the Spring Thaw exhibit, its pretty flowers abloom in a meadow being fed by melting waters from mountain peaks. And how aridly spot-on was the desert mock-up in which cacti and other life forms thrived in their own stark way, making do with very little of the wet stuff. Plenty of water (in an irrigation ditch), however, was present in the tulips field display. Those flowers jolted the eye in washes of yellow, purple, red and other members of the spectrum. I’m a sucker for splashy swaths of color, so I spent quite a lot of time letting them raise my spirits. There, more than anywhere in Wonders Of Water, the name Philadelphia Flower Show truly applied. Sandy and I passed many minutes together in the themed section. Then we separated for a while, she investigating the sections of the show outside the Wonders Of Water boundaries. I however stayed within those boundaries. The creations there satisfied me very well, and I felt little desire to stray. Before we knew it, two hours had passed. Sandy by then had rejoined me and we decided to call it a day. 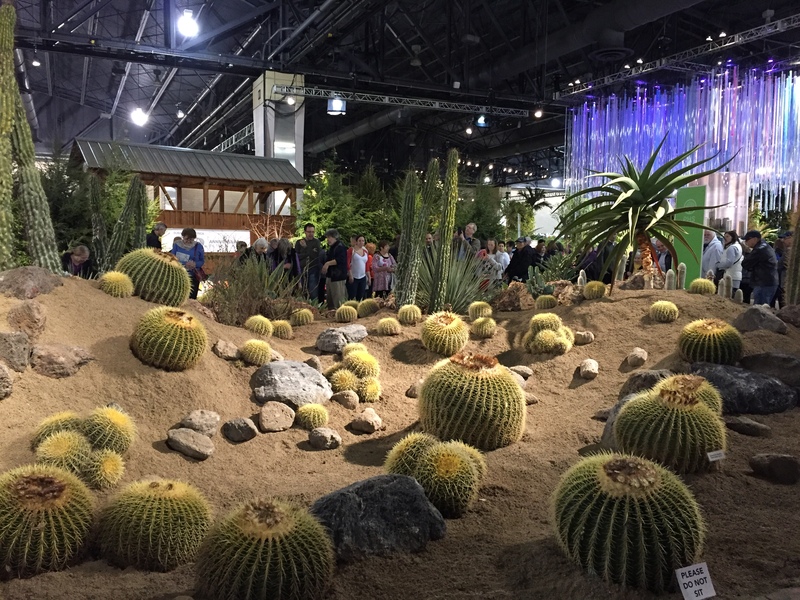 Our visit to the Philadelphia Flower Show had been a good one. But that’s not the end of the story. I’ve given the visit some thought in the process of composing that which you now are reading. And I’ve come to realize that what the show had to offer me, beyond its immediate delights, was the impetus to get out into, and explore, nature. I imagine that such is one of the Philadelphia Horticultural Society’s main aims in mounting the exhibition each year. I have plans to head west to New Mexico in 2018, where my brother and sister-in-law recently moved. There I’ll mosey around the deserts, remembering, of course, to lather on sunscreen beforehand, as all good little boys and girls should do. And, closer to home, in fact only seven or so miles away, I’ll hike the trails inside Pennypack Park, a nine-mile long forest, bordered by residential streets, that runs through Philadelphia’s northeast section. Call me crazy, but I plan to try and hike the park’s entire length in one session. The last time I walked that far in one day was when I was in my 30s. I’ve recently tiptoed into my 70s, so who knows if nine miles is within my engine’s capabilities. If I make it all the way, and even if I don’t, you can bet your sweet bippy that I’ll be writing about the expedition on this blog’s pages. Thanks, Philadelphia Flower Show. I enjoyed you quite a lot this year. If I remain above ground for a good while longer, then I’ll see you again. Next Article Harvard University’s Commencement Speaker This Year Will Be . . . Moi! Good luck with your new-found impetus to explore the natural world. I look forward to reading your accounts of the deserts of New Mexico and Pennypack Park. Hi George. Thanks a lot for stopping by. I’ve always liked wandering around in the natural world. Haven’t done as much of it as I’d like of late. I’m definitely looking forward to the open spaces of New Mexico. I’ve never been to one of these horticultural extravaganzas. It’s amazing what can be contrived with enough plants and ingenuity, for a short time, anyway. Love that cactus with the “Please do not sit” sign. That would be a painful experience! Hello Audrey. It’s pretty funny that the display designer thought a sign was needed! Have a good day (and don’t sit on any cacti). Neil, I love how you’ve been inspired to set out on your adventures this year and you can do it!! The show looks lovely but slightly odd to me! The flower shows here in the UK are mostly outside and if indoors, some will be in a large tent! The tulips were very pretty and a burst of colour here and the installations dramatic. Hi Annika. 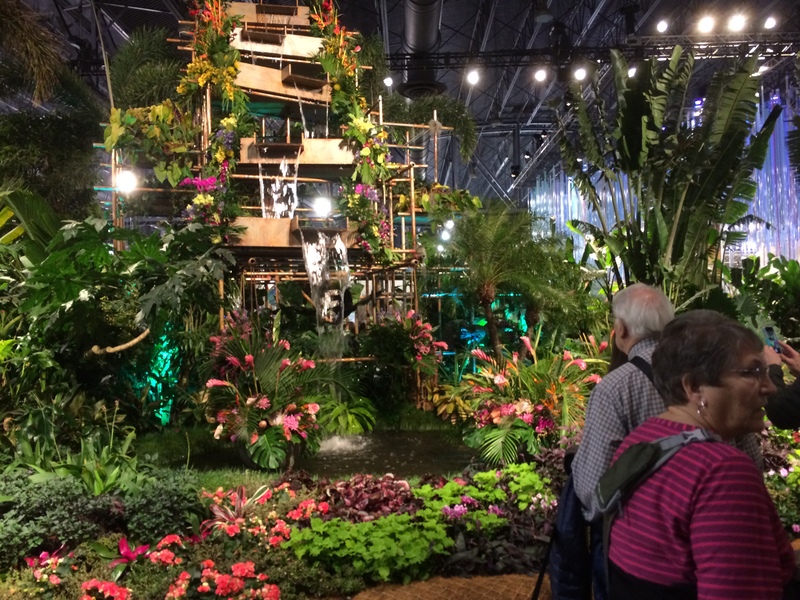 The Philadelphia Flower Show has been indoors for as long as I can remember. But it dates back to 1829 — possibly it was outdoors back then. Anyway, I appreciate your stopping by. Enjoy the day. 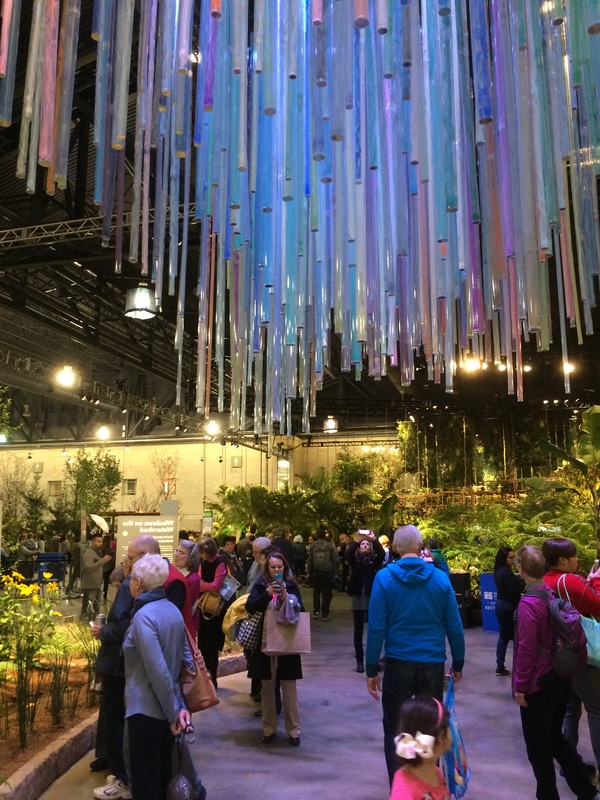 Thank you for sharing your photos of an amazing flower show. An incredible feat when it’s all indoors and is on such a grand scale. It gives the feel of what is out there in nature so you can then go and see the real thing. Really like that cactus display. Visiting New Mexico with it’s desert landscapes will be a wonderful experience. Look forward to hearing about these adventures. The show this year drew a lot of people. A quarter million or so. It’s good for the city’s economy! That is some show, and your post with pictures certainly illustrates why it’s worth going to. Wowsah, as we would say in Maine. Best of all, along with giving you a much-needed jolt of color, the show has inspired you to be in nature near and far. True, expansive, unadulterated nature doesn’t exist anywhere in my region. The hands of man are everywhere here. But you don’t have to go too, too far to get into large, natural areas. Even nature that has been touched by people can be lovely and soothing. In the woods, in the back of our house, are stonewalls. Once this area was fields. Now the trees have grown back. My goodness – how stunningly beautiful all those blooms are. Thank you for sharing! Great review and pictures . Always beautiful show. Too many booths with nothing to do with flowers or nature . Morning, Joyce. The people who put on the show did a real good job this year. 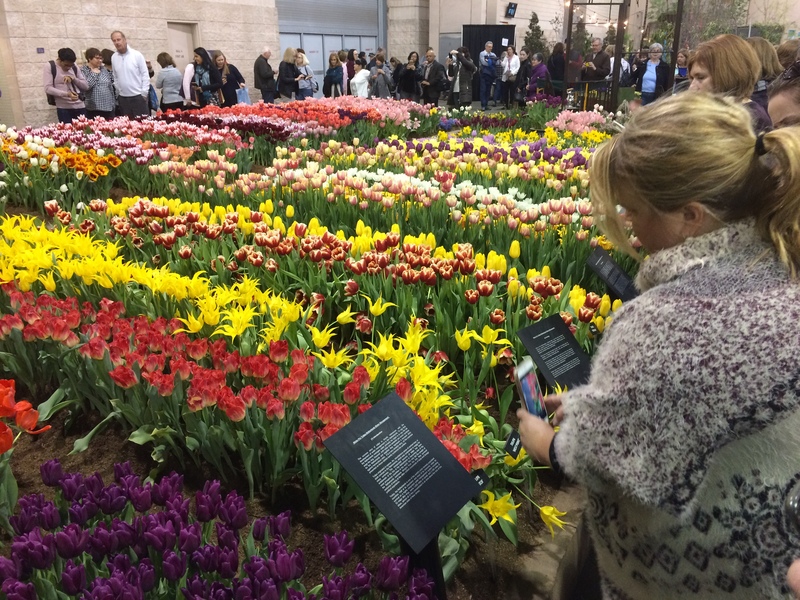 I enjoyed your post, I’ve never been to a flower show on this scale. Extravaganza is the word, looks like a pretty spectacular affair, and amazing to construct something like this indoors. And the fact that a non-horticulturist could find two hours of enjoyment is a good testimonial. Where I’m currently living, Boston decided to go with a Snow Show this spring, with a Wonders of Slush theme, splashy swaths of dripping noses, and colorful reddened cheeks. We have family in New Mexico, too, about an hour’s drive from Albuquerque – -you can take a cable car from the city, up to the Sandia Mountains – great views and cooler. And if you happen to have a lightning storm blow through while you’re there, it’s worth driving to Pie Town, about 2.5 hrs SW of Albuq., to see Walter De Maria’s Lightning Field (wear rubber-soled shoes 🙂 ). Thanks for the New Mexico tips. I’ll definitely keep them in mind. If you would like a few other nature suggestions for NM and you will be if in the Albuquerque/Santa Fe area, I’ve lived near ABQ most of the time since ’83. Enjoyed reading (and seeing) your perspective on the show! That rain forest was spectacular. I hope you’ll go again next year and write about it–the theme will be Flower Power. Could be groovy, man! I like the sound of Flower Power. It might be great. What a treat! This just reminds me that, now that I live in some remoteness, I miss out on these kinds of extravaganzas that only a major metropolitan area can present. It’s not enough to make me take up the traffic and other annoyances of big city living again, but a nice memory of one of the perks. Thanks, Neil. Glad you liked this peek into Philadelphia. Thanks a lot for adding your thoughts, C C.
Glad you enjoyed it all despite not having a green thumb. We have something called the Chelsea Flower Show every year where show gardens miraculously appear out of nowhere then disappear after a week. I haven’t been yet but it’s on my “bucket list”! There’s a Philadelphia Auto Show each year. It’s held in the same building that the flower show is in. I’m not sure if 2018’s auto show has taken place yet. Anyway, it too is very popular. Hordes of people go to it. I’ve never been! I’m looking forward to hearing about your trek around PennyPack Park! I’m not sure I could do nine miles anymore, but who knows? In the right environment, anything is possible. The flower show sounds well worth the visit, and I’m glad you and your wife decided to give it a try. I don’t know about you, but I have noticed that as people age, they tend to become a bit more interested in nature. Perhaps because we are looking forward to that time when we rejoin it (dust to dust, and all that….) or simply because we slow down enough to notice the beauty around us, I’m not sure. Thanks for a fun post! I went to Pennypack three times, I think, last year. Took modest hikes each time. But the idea of walking its nine-mile length is appealing to me. Of course, someone will have to meet me with a car at the end — I ain’t walking back another nine miles to the place I started from! They do a real good job. It’s an eye-catching event. It sounds as if you and I have about the same level of gardening expertise! You guided me through a spectacular flower show. Thank you! I don’t have green fingers either but I’d love wandering in the ocean of flowers. Beautiful! Hi Isabelle. The tulip field at the show really was beautiful. I’d like to see the real thing in Holland. Tulips and roses are my favourite flowers. Fabulous photos, the flowers remind me of spring which hopefully, is not far away. Lovely post! Enjoyable as ever, Neil. It’s good to be reminded of colourful floral displays as the wind picks up here and the temperature gauge heads below zero again for the weekend – April might be the cruellest month, but March is pretty mean to plant life round here too. Roll on Spring! March has been a pain in my neck of the woods too. A week ago a foot of snow fell from the skies. LOL Neil, I AM a gardener (had to do something with that mess out front), and I’m not sure I could have managed the Flower Show as well as you and Sandy did. Though I must admit, just two days out of the last Nor’easter, the Spring Thaw exhibit snagged my interest. I’m glad though that it sparked your interest in getting out into nature. Nature is good. Nature is respite from the nutters and “the times we live in.” I’m rooting for your nine-mile hike.Have faith in the biological fact that we were made to walk, take a couple litres of water, and maybe do a few deep kneebends before heading out the door. Dozens of years ago I did four 20-mile hikes in order to get the Boy Scout hiking merit badge. So, hiking is in my blood, it seems. Bye, Amy. Enjoy the day. CB always has his “horticultural groove” on. I like that one Neil. I’m going to use it until my gal tells me to stop it. She’s a bit of an earth mama. I just watched Robert ‘Plant’ on Austin City. I’ll meet you for a walk in New Mexico. I do like your writings on your adventures. Plant is a big talent. If you get a TV network called AXS, then check out Dan Rather’s interview show. Plant was a recent guest on that show. Yeah he’s one of the few from that generation that’s still making interesting music. I seen the Rather bit. Many thanks. I appreciate it. One does not need to have a green thumb to appreciate all the beauty and variety of the world’s flora, Neil. I am excited for you about your upcoming trip to New Mexico. I remember you mentioned wanting to experience the West! I look forward to your trip report(s)! Hopefully I’ll be there within the next few months. This looks fabulous! I’ve heard about these flower shows and now you’ve inspired me to attend one. I haven’t been to NM but went to Tuscon a few years ago. While I love green forests, I was all agog over the beautiful desert scenery, the cacti and the mountains. Enjoy yourself. Hello, Marie. Good to hear from you. I’m looking forward to New Mexico. It’s been many years since I’ve been in desert territory. The family and I have talked about going for years…next year, for sure. Great photos. Next year’s theme is Flower Power. Might be a real good show. Thanks for stopping by. Appreciated. Sounds fun. We’ve lived in the area over a decade, slow to the take obviously. I love these outdoor events, so specialized – therefore so civilized. My favorite presentation is the pod-like cacti. Hi Kimberly. The cacti are cool. I suppose that my fave display was the tulips field. Nice photography! Some of those pics reminded me of Willy Wonky, the first time they go into his “showroom” with all the wonders in there. The flower show looks magical in some of those shots. Hi Stacey. Always good to hear from you. Yup, I can now see why the flower show in Philly is so popular. I had a real nice time there. Hey there, Carol. Good to hear from you. Thanks for adding your thoughts. May the road carry us all to good places. Hi AOC. I’m glad to hear from you. You’re right about plants. They are much better behaved than humans and other animals. I love being in forests, surrounded by beautiful trees. I hope the garlic flourishes! My work has an installation there every year which I generally help construct, but rarely to do I go to the actual show because of the crowds! Did you help build a display at the show this year? First year in about a decade that I haven’t and I really missed doing it. I’ve never been to Singapore. It sounds like a fine place. Thanks a lot for adding your thoughts, Amor. I appreciate it. I bet the air smelled so wonderful, with all those plants. Yes, it was very fragrant in there.